Viña Mambrilla obtains gold and silver medal in two of its wines. The wines Alidis Expression 2014 and Alidis Crianza 2014 are awarded the gold and silver medal, respectively, in the Vinales Internacionales competition held in Paris from 23 to 28 February. 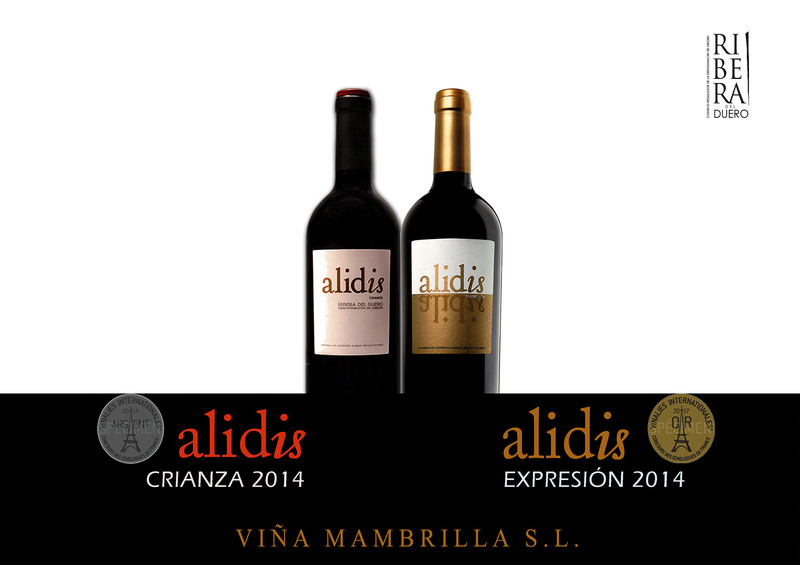 Since 1994, the French Winemakers’ Union has organized this prestigious competition whose repercussion is well known internationally.The Ribera del Duero winery, Viña Mambrilla, shows to the competition Alidis Crianza 2014 and Alidis Expresión 2014 two single-varietal wines, 100% Tinta del País, whose vines are obtained from grafts of centuries-old vineyards belonging to the family that owns the winery.In the case of the Alidis Expression 2014 is made from grapes that come from a vineyard parcel of more than 40 years of antiquity oriented to the South. Its location, sheltered from the inclemencies of the weather and the characteristics of the soil, give the vineyards an exceptional development that is transmitted in this wine. Considered as one of the favorites of the Alidis range of wines for its hints and its explosion of taste in the mouth, it is possible to emphasize, in its elaboration, characteristics like the malolactic fermentation realized in barrels of new French oak and its production limited to 10,500 bottles. In the case of Alidis Crianza 2014, it is made from 40-year-old vineyards, grown in oak barrels, 80% French, and 20% American, and remains in the bottle for 14 months before launching to the market. In nose it offers intense hints and a well balance between the fruit and the wood, in the mouth it is fresh, soft and full of balsamic nuances. The winery Viña Mambrilla was established in 1999 within the Denomination of Origin Ribera del Duero, in Mambrilla de Castrejón, Burgos and it elaborate a range of seven red wines called Alidis.